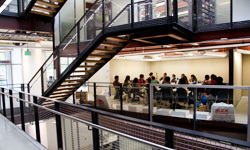 The Drexel Master of Science in Design Research (DSRE) is a two year program that focuses on combining a transdisciplinary design approach with an intensive research process to develop solutions to human design. In this self-defined and flexible program, which can be taken full or part time, students have the ability to chart their own customized pathway to consider multidisciplinary problems beyond the scope of traditional boundaries of individual design disciplines. The curriculum, though self-directed, is grounded in research, studio class work, philosophy, theory and iterative making. Through deep cross collaboration, our students create cutting edge solutions and speculative environments to study human and culture centered design. Topics explored include experimental materials, and environments for users with a variety of needs, cultural and societal solutions for underserved populations, biophilic living, design fiction, and near future speculation. Located in Drexel’s world-class research environment, students within DSRE are encouraged to engage within the wider university and the city of Philadelphia. Our Design Research partners and collaborators include: Philadelphia Department of Public Health, The Center for Architecture, The Lindy Institute, Fit City, The Scattergood Foundation, Ballinger, ExCITe Center, Philly Nexus Coho, Philadelphia Rise, The ShimA Seiki Lab, Advanced Functional Fabrics of America, Design Philadelphia, and the Drexel Dornsife School of Public Health. We welcome both experienced designers and those with a design-based interest to chart their own customized path within our Design Research graduate program. All students are placed within the curriculum through conversations with faculty and advisors who guide them based on their interests. Our faculty are nationally and internationally recognized. This program will empower you to be a leader in the complex practice of design. The program can be full or part-time with the option to work while pursuing your degree.